A selection of dried beans purchased from a bulk food store were cooked. The beans were washed, boiled for about 45 minutes, washed again, placed in the pressure cooker and cooked for one hour.The cooked beans are soft and will be stored in the freezer and refrigerator and used as a substitute for meat. Ketchup is added for flavor just before serving.There are several methods of cooking beans, but whatever method is chosen, they must be thoroughly cooked for digestion. 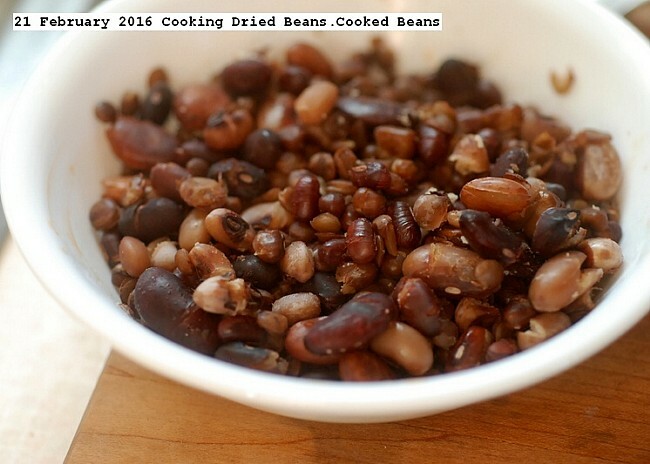 This entry was posted in Uncategorized and tagged 21 February 2016 Cooking Dried Beans, Cooking Dried Beans. Bookmark the permalink.